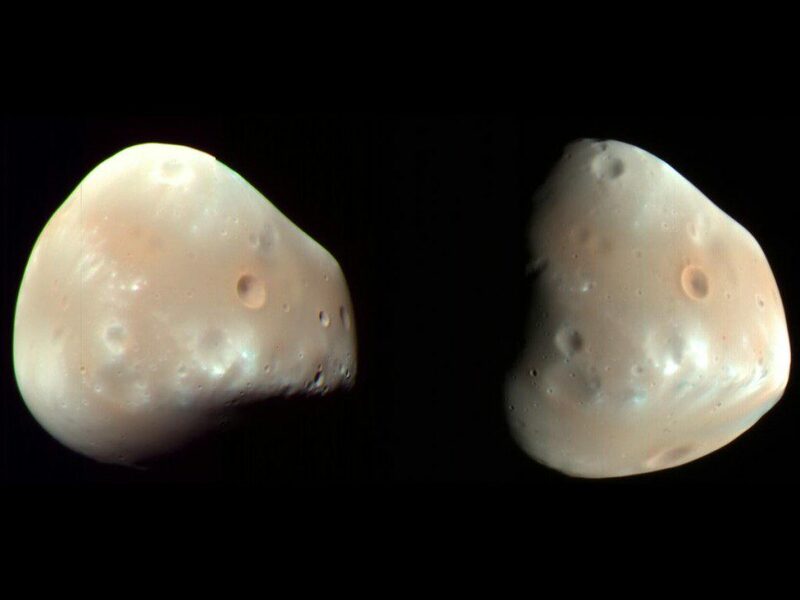 Deimos (pronounced DEE-MOS) is the second moon orbiting the planet Mars along with Phobos. Considered the second moon of Mars because it’s orbit path is much further away than Phobos, Deimos is also the smaller of the two moons with a diameter of just 12.4 km (7.7 miles). Unlike the Moon which orbits Earth, Deimos is a very strange shape and is not spherical like other moons in the solar system. The moon was discovered by American astronomer Asaph Hall on August 12, 1877 who discovered Phobos 6 days later after continuing the search for Martian moons. Deimos would appear at a similar size to a star when viewed from the surface of Mars. The moon is so tiny that it would appear in the sky at a size similar to a star. In fact, when Deimos eclipses the Sun, it appears as a small dot moving across its surface. At full moon, Deimos shines about as brightly as the planet Venus – which is one of the brightest objects in our solar system. It takes Deimos 30.3 hours to orbit around Mars. The orbit path of Deimos around Mars is almost circular and it travels around the equitorial plain of the planet in 30.3 hours – which is nearly 6 hours longer than a day on Mars. The moon is named for the son of the Greek god of War, Ares, and means Terror. In Greek mythology, Deimos is the son of Ares, the Greek god of War and is the personification of terror. He was known to join his father in battle along with his twin brother, Phobos, which is of course the name of the first moon of Mars. Deimos might be an asteroid. The shape and matter that Deimos is made of suggest that it may be an asteroid that was pushed by Jupiter from the asteroid belt and pulled into orbit by the gravity of Mars. However, the orbit path of the moon is circular and stable and would require braking by the atmosphere – a mystery that deepens because Mars is known to have a thin atmosphere. Deimos has two large impact craters called Swift and Voltaire. Deimos has far fewer impact craters than it’s brother Phobos, but the two biggest craters on the moon are Swift, which has a diameter of 1 km, and Voltaire with a diameter of 1.9 km. Swift was named for Jonathan Swift, the author of Gulliver’s Travels who wrote about the two moons of Mars in 1725 – 151 years before they were discovered! Voltaire is named for the French writer François-Marie Arouet who was better known by the pen name Voltaire. Deimos rises in the east and sets in the west once every 2.7 days. Unlike Phobos, which orbits so quickly that it rises in the west and sets in the east. Because the orbit of the moon (30.3 hours) is greater than a Martian day (24.7 hours) the moon only rises and sets once every 2.7 days to an observer on the surface of Mars. Deimos is moving away from Mars. Also unlike the moon Phobos, which in 50-100 million years will collide with Mars, the orbit of Deimos is actually taking it further away from the red planet. Eventually, the moon will be cast off into space when it gets too far from the gravity of Mars to remain in orbit. This is a similar temperature to that of Phobos, ranging from around −4°C (25°F) on the sunlit side of the moon, down to around −112°C (−170°F) on the shadowed side. Deimos has been visited by a number of different spacecrafts. The first craft to explore Deimos and Phobos was the Mariner 9 in 1971, which became the first spacecraft to orbit a planet. The moon has also been visited by the Viking Orbiters, the Soviet Phobos 2, NASA’s Mars Global Surveyor, the European Mars Express and the ground rovers Spirit, Opportunity and Curiosity.